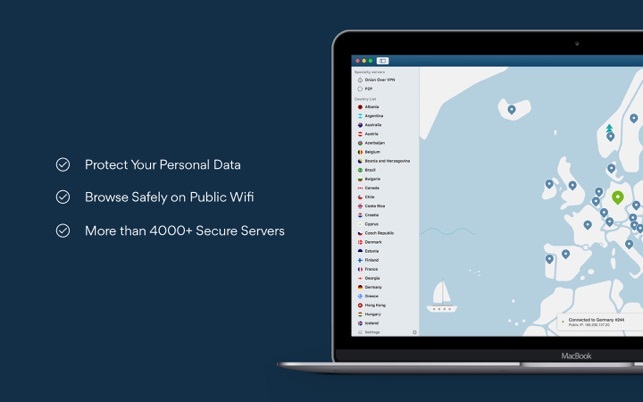 With NordVPN app for your Mac, you can privately surf the Web and secure your Wi-Fi connections against various cyber threats. Open the app and pick one of our 5000+ remote servers that are located in 60 countries. This will hide your IP address and you will appear to be somewhere else. 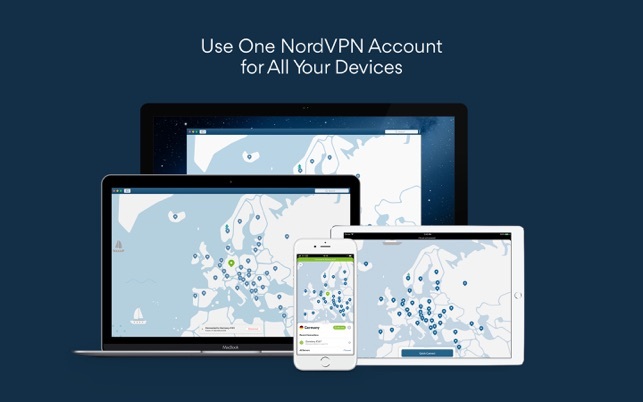 With the NordVPN app on, all your Internet traffic is strongly encrypted and extremely difficult to decipher. What is more - we don’t keep any logs of your activity. 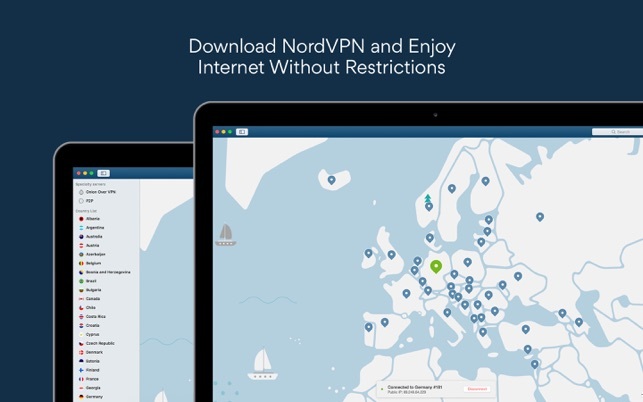 It’s nice to know that using the NordVPN app, you can easily access websites and stream your favorite videos, even if they are not available in the country you are traveling. It’s bliss for travelers! Click the activation button to turn your protection on and off. To select a server, simply click on the map or browse the country list. Ready to go? Try NordVPN for MacOS now! 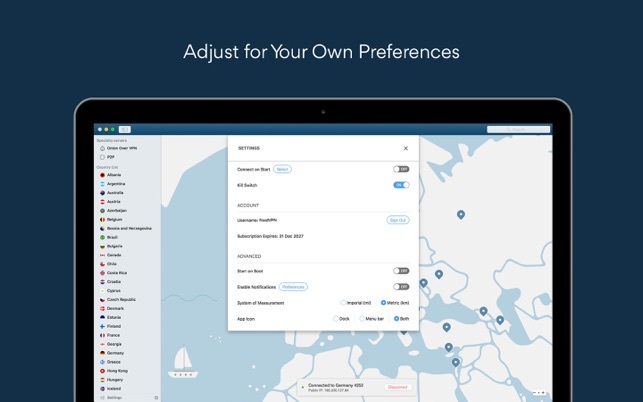 • NordVPN is a paid service so you'll need a subscription to get started. You can choose from three subscription plans: $11.99/month, $53.99/6 months and $83.99/12 months. • The payment will be charged to your iTunes Account at confirmation of purchase. • The subscription renews automatically unless the auto-renew is turned off at least 24 hours before the end of the current billing period. • Your account will be charged for renewal within 24-hours prior to the end of your selected subscription. • Your subscriptions can be managed and auto-renewal can be turned off by going to your App Store Account Settings. – Connect to NordVPN, then look at the sidebar. Your recent connections will appear there, so you can switch back in a blink. – You can now select specialty servers for the ‘Connect on launch’ option. What is more, the specialty servers are now listed by country. – UI tweaks: a resizable sidebar, new icons for server categories, and a few other nice touches. – Opening the app and seeing all server pins GONE… We’re sorry if we made your jaw drop with this one – we didn’t meant to terrify you. The mysterious case of disappearing servers is solved now. – A bug fix here, a bug fix there. Small improvements and tweaks. YOU CAN STOP YOUR RESEARCH, YOU FOUND THE BEST OPTION. Not only this BUT nordVPN offers features no other VPN does such as P2P and OnionOverVPN Which make finding out who you are even more impossible than just running the normal VPN. ALSO, they have sooooo many different servers … the list is probably the longest any VPN offers. They also offer a kill switch… which means if for some reason the VPN fails while on the internet, internet access will drop … meaning you won’t accidently show who you are. THEN ON TOP OF ALL THAT it’s crazy fast, you honestly can’t even tell you’re using a VPN. Most VPN’s I have tried are really slow or stop working after 15-20 minutes and you have to restart them. NOT THIS ONE THOUGH… I have never had it freeze up, forcing me to research, had the kill switch do it’s thing, or had my internet be slowed down at all. Hands down … it’s the best! BE SMART AND CHOOSE THIS ONE! Using this VPN allows me to visit some websites or download some videos. This is an important reason why I like this VPN. But within a certain period of time when I was using this VPN, when I opened the app again and chose to go to a website to watch a video, I couldn't get to that site, go to some websites that downloaded the app, and couldn't access the site. , I really do not know what happened, everything is normal before it is clear, I am very disappointed with this app. the user experience before the start is very good, how can you return to these sites without any reason, I am skeptical about this app. What exactly caused this problem? Moreover, in this written assessment, no one else has ever had this problem. What can I do to solve this problem? Another point is that although there are many countries where we can choose this vpn, but some of them cannot be connected at all. It is impossible to visit these countries and I can only give up their visits. I don't use this VPN to access these websites. I'm very disappointed with this APP. I hope to find other VPNs on the APP store to replace him. I want to watch videos and I can't do this. I downloaded There is no use using this app. These are my personal experiences. Other aspects of this VPN are still possible. There are a few tips that have affected my use. I am not planning to use this VPN. i hope that developers can pay attention to this issue, after all, have spent money on this. Here in the SF Bay Area, right around the corner from silicone valley, I’ve had a 100mbps connection for the last year and a half; early on when I used their openVPN client I found my speeds that regularly clocked over 115mbps were being cut by 30% at best and often 60% on the worst servers nearby. I also noticed that one of the versions all of a sudden had the server’s distance away totally incorrect. I’d regularly find a server apparently hundreds of miles away that turned out to be in the NE. Eventually I was instructed to download a newer version for which I was provided a link. Fewer problems with the GUI and listing of servers, but I couldn’t use the kill switch, and well…It was probably 6 months ago I was instructed that I’d have to suffer some security to gain faster server speeds and download their IKE2 app; faster, but most servers still cut speeds by 40% during normal hours. Then there was the problem with a recent version no longer allowing me to see my favorites list easily; I’m still waiting for the favorites to also list distance of server and more useful data. And now I’ve been gifted with a version which crashes within seconds of intializing without fail. My customer service emails have piled up. So on to the next fix I have to make in order to use a program which can’t update in a proper automatic fashion. Silliness. Hello and let us apologize for the inconvenience. However, we'd ask you to update your review with the ticket ID that you've received after contacting our customers support team, for us to check what has been done on their end in order to assist you, and escalate the matter afterwards.